CECL will increase the allowance for loan and lease losses (ALLL) by nearly 18 percent, but the bigger banks would feel the brunt of the pain. Ironically, slightly more than two-thirds of banks under $50 billion in assets will NOT feel a significant impact from CECL. Only about 31 percent of these banks are under-reserved and vulnerable. Bank size matters. The larger the bank, the more CECL should hurt. These findings fly in the face of nearly everything reported about CECL in the last 12 months. When the proposal was first debated, even regulators suggested that it would in- crease loan loss reserves by 30 to 50 percent, especially for community banks. Those estimates were computed when the economy and the banking industry were still in the early stages of recovery from the Great Recession. Times have changed. 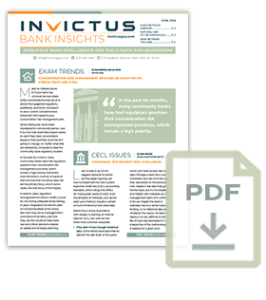 Invictus calculated its CECL study by using its proprietary capital stress testing system, but turning off the stress and adjusting the time horizon to reflect the “life of a loan” concept underpinning CECL. The Invictus stress testing system is uniquely qualified to perform this analysis because the methodology is consistent with the main CECL principles: loan portfolio segmentation, vintage analytics, expected loss modeling and risk rating migration patterns. Smaller banks also tend to prioritize the preservation of conservative underwriting over winning new business at any As a result, their existing loans tend to have lower loan-to-value ratios, higher debt service coverage ratios, and more importantly, they tend to grow less aggressively in ‘good times’ (knowing all too well that the worst loans are made in the best of times). Smaller banks tend to be more focused on real estate loans, which are less risky than the C&I and con- sumer loans that tend to represent a greater portion of a bigger bank’s balance This diff is exacerbated by the reduced exposure of small banks to construction loans since the financial crisis.More than 90 percent of a bank’s loan loss reserve today is derived from qualitative Since charge-offs in the industry have significantly declined over the last three years, banks simply do not have a meaningful history of losses on which to build an adequate loan loss reserve. As a result, CFOs are forced to depend more on these qualita- tive factors – which are supposed to be a proxy for the forward-looking component of the existing ALLL. The problem is that the qualitative factors have virtually no data or science behind them, leaving CFOs to resort to guesswork and art. What CECL will do is replace the guesswork with analytics, leading to lower loan loss reserves for many banks. Despite the inconvenience and cost of implementing CECL, the silver lining for community banks is that the data shows that many of them should benefit from it. Please read on for how to prepare for CECL in the short-term.